I have a question and can't find any history thread. My apologies in advance. 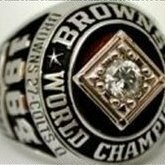 Does anyone remember Bernie Kosar winning the Quarterback challenge. Beating Joe Montana and Dan Marino. If so how come I can't find anything about it? Help stop the argument between to old friends. We all said that about Belichick. Imo LeBron and Durant match up decides the series. Durant had the highest production and his opponents had the teams lowest production allowed. His on court off court was night and day. GS lost key players to obtain Durant. They are not the same team without him. Their only skid this year was without him. LeBron has owned Durant his entire career Curry is the greatest shooter I've ever seen but lacks super athlete ability and kyrie is a perfect match. Fast enough to not be exposed on D and skilled enough to score on him. If GS chooses again to not let Love beat them and live with the out come we win this series in 6. He is the one player they can control and outcome will be bad for GS. The sacrifice will come at a great cost. The floor will stay spread and LeBron and Kyrie own them inside Just want to be on record saying it. Like it. This is good start. Is it time for optimistic thinking yet?